Derek Meeuwisse, an undergrad student in kinesiology, lives and breathes volleyball. 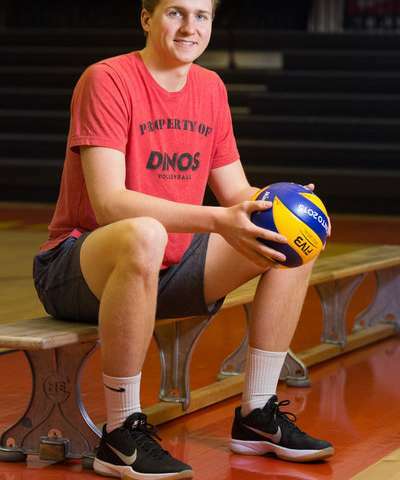 He plays on the Dinos men's volleyball team, he coaches youth volleyball, he conducts research for concussions in volleyball, and now his findings are beginning to change the way players warm up and practice volleyball. While surveying competitive youth volleyball, players between ages of 12 and 17, during a summer research project at the University of Calgary, Meeuwisse made a surprising discovery—playing an actual volleyball game was less hazardous than the warmup and practice sessions. He found 15 per cent of the concussions happened during the warmup and 46 per cent happened during practice. "When players practice hitting the volleyball over the net, they duck under the net to retrieve the ball. My findings showed that when they had their back to the other players to retrieve the ball, they were more likely to get hit in the head and get a concussion," says Meeuwisse. Meeuwisse was motivated to conduct research in volleyball after he and his teammates had suffered concussions during games and practice. Volleyball Alberta has created new policy so players must go around the net rather than duck under and parents and coaches help to retrieve the ball so eyes are on the players. Volleyball Ontario has created strong recommendations based on Meeuwisse's research. To help make the sport safer, Volleyball Alberta used the findings to create a warmup video to share with others, demonstrating the safe way to retrieve the ball. "The work that Derek is doing builds a foundation for us to understand the injury landscape in our youth volleyball. No one else is doing this. The fact that it has already been able to inform policy change is fantastic," says Kerry MacDonald, head coach for UBC men's volleyball, and director of sport science with Volleyball Canada. "I am certain that with his continued efforts we will see other associations follow the lead of Volleyball Alberta." Meeuwisse was invited to share his study findings on concussion in volleyball at the 5th International Consensus Conference on Concussion in Sport in Berlin, Germany in October of 2016. Meeuwisse credits the conference with setting his career course in research. "I was nervous, but it was incredible to share the findings and be exposed to this amazing group of academics and in Berlin at an international conference besides," says Meeuwisse. "It was a total inspiration, and now I want to continue with my research and pursue a master's degree." It is uncommon for an undergraduate student to be invited to present at an international conference of this caliber, says Kathryn Schneider, his research supervisor, and an assistant professor and clinician scientist (physiotherapist) in the Faculty of Kinesiology. "Derek did an excellent job presenting at this international conference, which is an amazing accomplishment considering how early in his academic career he is. His work to date is exemplary and it will be exciting to see where he goes in the future," says Schneider. Meeuwisse is currently building on his research by evaluating the risk factors for youth and varsity volleyball players.